Visit to St Martin`s Island (A christian name in a Muslim Country) a beautiful coral island 20 miles off the coast of Bangladesh. Visit to St Martin`s Island (A christian name in a Muslim Country) is one of the activities from Cox`s Bazar.package, which costs between 1000 to 1500 Taka. 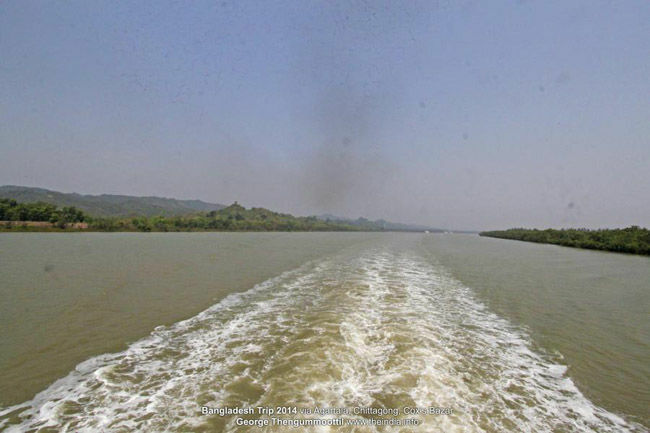 The package can be booked at Chittagong or Cox`s Bazar, which includes, charges for pickup and drop to the jetty, lunch, tour guide and cruise charges. There are a couple of hotels in the island and visitors can stay at the island. Most of the islanders are fisherman. There are a lot of small uninhibited islands surrounding the main island, but not advisable to visit alone. Salt lakes between Cox`s Bazar and port to St Martin Island. 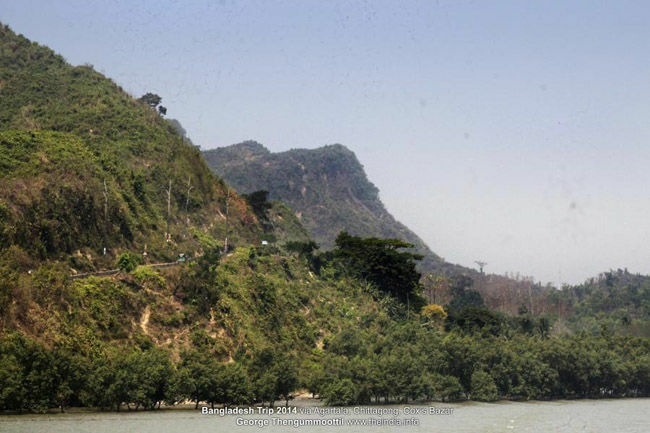 The hills seen at the horizon are the only hills in Bangladesh, an extension of south east himalayas which spreads over Mynmar andBangladesh. 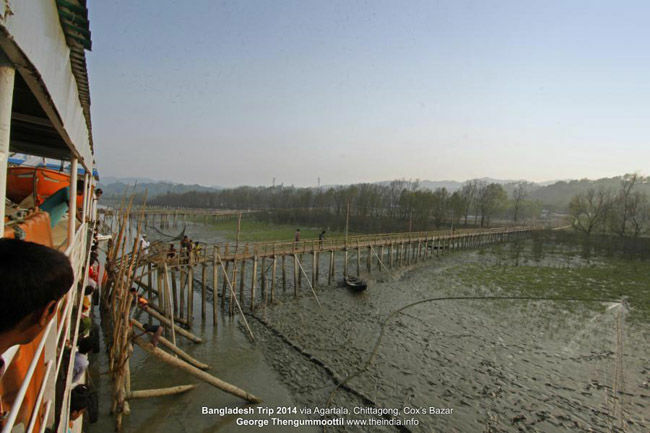 The average height is not more than 100 meters above sea level and is one of the protected areas of Bangladesh. This range runs from north to south as a 20 kilometer wide 120 kilometer long peninsula to the south of cox`s bazar, forming the longest beach in the world. View of the eastern side of the peninsula to the south of Cox`s Bazar. Its a very good Idea to drive along this hill route, with a beautiful view of Myanmar and the backwater separating Mynmar and Bangladesh. This photo was shot from south, from the boundary backwater, during my trip to St Martins Island from Bangladesh. Backwater separating the countries of Bangladesh and Mynmar. A lot of fishing communities live here who are at times arrested by Myanmar Soldiers, in the name of illegal boundary crossing during fishing. The center of this water channel is the official international boundary. The fishing boats at Dakshinpara, belonging to the fisherman community of Bangladesh. 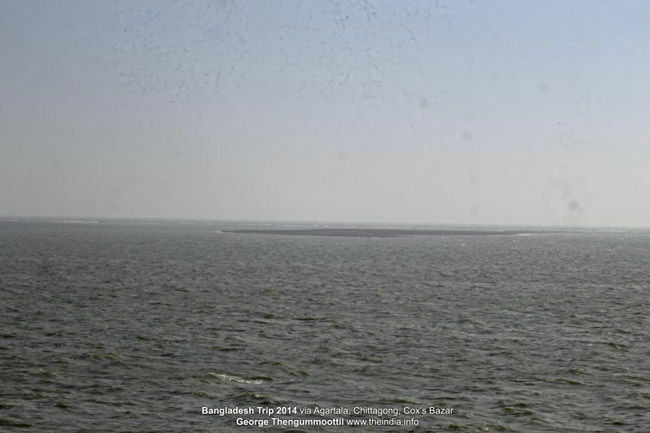 Dakshinpara is the southernmost point of the mainland of Bangladesh. The beach has a long elliptical shape: the only place in the world. 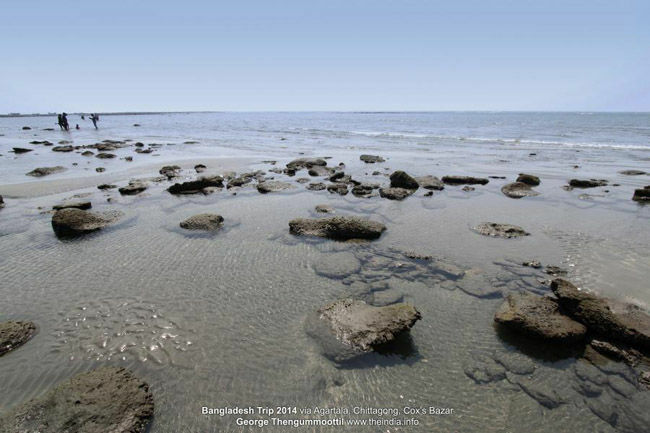 CLEAR WATERS OF ST MARTINS ISLAND : a coral island 30 kilometers south of Bangladesh Mainland. There are a couple of cruisers from main land to the island. The deep sea is not very far from the island and visitors are advised not to swam more than 20 meters from the shore. Accidents occur frequently and many tourists die, mostly college students. THE SPECIAL RICKSHAW FOR TOURIST AT ST MARTIN ISLAND : A lovely cycle rickshaw in St Martin Island, to take the visitors around the island. NOMANS ISLANDS ON THE WAY : There are many small islands around St Martins Island, which magically emerge out of the sea during low tides. Its not advisable to visit these islands as they sink down into water in moments. EVENING FISH CATCH: Fishing boats of Bangladesh fisherman, at the cost of Bangladesh, near Cox`s Bazar. BACK AT PORT IN BANGLADESH : The jetty at Teknaf, for anchoring the cruise running to St Martins Island. Rajeesh Kumar P R, Madrubhoomi Special Correspondent, Agartala. This post was originally published on Theindia.info.